Please see our Frequently Asked Questions (FAQ) Below. For any other questions please fill out our contact form. Fine Oak Things has been in business since 1989. Our flagship location is located in at 43 Main St. South in Milton (Campbellville), just south of the 401 on Guelph Line. 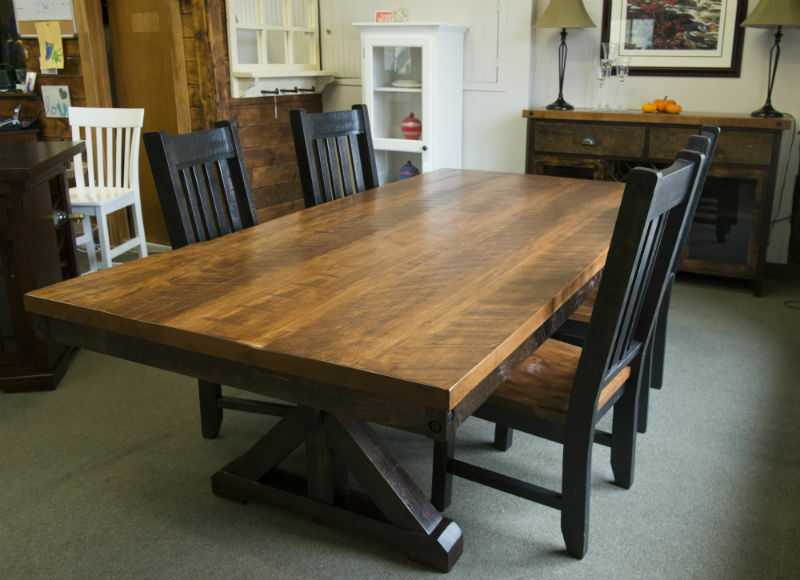 The vast majority of our furniture is manufactured in Ontario by Mennonite and Amish craftsmen. Our builders are expert furniture makers whose traditions and craftsmanship has been passed down through generations. They do not sell directly to the public and manufacture their furniture on farms across Ontario – from the St. Jacobs/St. Clements area north through Owen Sound and across through Collingwood. Fine Oak Things also has several generational furniture makers across Ontario that are not of Mennonite or Amish descent. In addition to our Canadian builders, there are Amish builders from the Pennsylvania/Ohio border region that build for us as well. Do you deliver or do I have to pick up my furniture? We deliver across Southern Ontario and have made deliveries from Windsor to Halliburton and from Niagara Falls to Muskoka. The charge for local delivery (Milton, Burlington, Oakville and area) is $95 + HST. Additional charges would apply the further we get out from our showroom location (e.g. Toronto, Hamilton, Kitchener/Waterloo and cottage country). Set up is included in our delivery charge. For purchases outside our delivery area, we have freight partners that will deliver furniture either to the customer’s home or to a local depot. Our freight partners will not set up your furniture. Customers can also pick up their furniture at our showroom location, but Fine Oak Things accepts no liability for any damage that should occur during transport. We will help you load your furniture, but will not strap it down for you and we do not provide additional blankets or wrapping other than what our builders provide themselves. We are able to ship the boxed Recycled Patio furniture via Fedex. We stain the majority of our furniture ourselves and offer a wide range of colour finishes. Some of our builders will do their own finishing and have their standard colours from which to choose. We have the ability to provide colour matching services as do our builders, but extra charges will apply. There is often a standard colour that is close enough to the existing colour that we can avoid the extra charge for colour matching. Is there a charge for customizing? That depends on what is being customized. For example, changing the stain colour will not change the price. We also do not charge for minor (+/- 2″) alterations to the standard sizes of furniture. Changing the type of wood will also change the price, as different woods have different costs. Adding features such as doors, drawers, shelves, etc. will add to the cost of a product. There will also be a charge for larger alterations (>2″) to the standard sizes of furniture. To calculate the additional cost, divide the price of the unit by the measurement and multiply by the larger size. For example, if a 60″ TV stand costs $1,000 and you would like to know the price of the same TV stand but 66″, you would divide $1,000 by 60 and multiply by 66 to get $1,100. There is no discount for making products smaller. Do I have to base my design off a standard product or can I bring in a picture of what I want? It is easier for our builders to make design adjustments off of an existing product, but we can also design pieces from scratch. Our builders can accommodate most requests if they have a picture and measurements. It may take a business day or two for us to quote on these requests. Certain exceptions that our builders will not accommodate would be: custom chair designs, engraving or scroll work, or custom turned designs. However, it never hurts to ask. Unless otherwise specified on your order, all products are deemed to be standard size as specified on our web site and/or the builder’s catalog. Do you sell floor models or do I have to order pieces? How long does it take after ordering? Most of the pieces will need to be ordered as there are far more pieces in our catalog than we can show in our showroom. The pieces will be made to your specification and stained in your choice of stain colour. We will occasionally sell pieces directly off the floor and may have discounts on certain floor sets (see Specials page for details). Floor models are sold as-is and are final sale. Our estimated lead time is 6-8 weeks from order date. Estimated lead times are given in good faith and are estimates only. Unforeseen delays in manufacturing and shipping are beyond our control. We appreciate your patience and understanding when these delays occur. All products will be ordered from the builder immediately upon your placing the order at Fine Oak Things. Any changes to your order need to be communicated in writing within 3 business days of order date. Beyond that period we cannot guarantee that your requested changes will be processed. We require a minimum deposit of 30% due upon ordering, but you can pay more or the whole invoice upon ordering should you wish. The full balance is due upon pick up or delivery. All furniture remains property of Fine Oak Things until invoices are paid in full. Any orders that were scheduled for pick up or delivery, but have not been paid for, claimed or delivered despite multiple attempts on our part to contact you will be considered abandoned after 90 days. At this point the pieces will be placed on our showroom floor and may be sold without recourse or refund. How do I care for solid wood furniture? Ensure that the relative humidity in the home is maintained between 35%-55% (especially important for the winter). Clean with a damp cloth. Do not use solvents or cleaners. Use coasters and hot plates to protect your furniture against damage from heat and moisture. Use padding under rough china and surfaces to protect against scratches. Do not scrape or drag dishes across surfaces.